The Crystal empire: a land not long ago being thought of only as myth. But now the magnificent, formerly enslaved kingdom was back and proving to quite the tourist attraction for their considerably less shiny neighbors down south. The smell of fascinating foods, the sights of the marvelous architecture, the happy smiles of it's citizens! Surely there were many good times to be had in this kingdom! ... Well sadly this kingdom is not where a certain mare had decided to begin her journey. Believe it or not there was a reason she decided to launch her newest machine in the northernmost area of the Crystal Kingdom's territory and not in the relative comfort of the city. 1: There was nowhere she could launch her latest project seeing as she couldn't afford to have it be land locked. 2: Crowds and too many sociable ponies made the hostess of this expidition feel rather ... awkward. The Cold weather however was something this mare could live without. 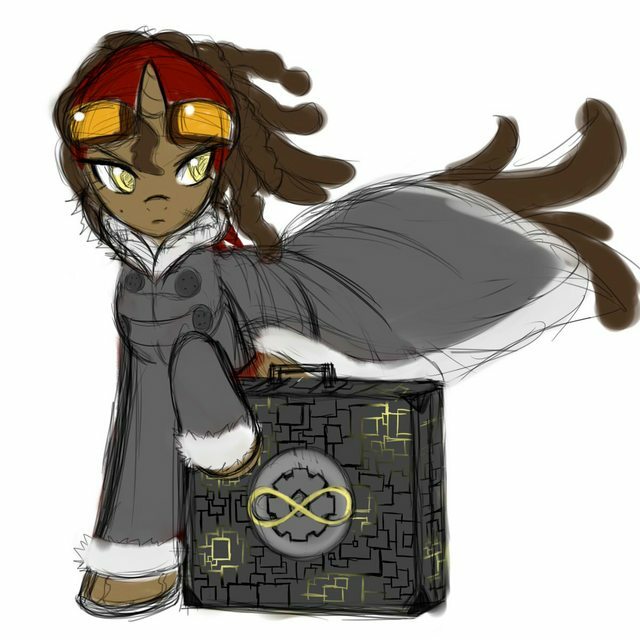 She opened up her briefcase and pulled out a hoofkerchief and sighed, 'Well at least any members of the expidition might be able to find me easier now." she thought to herself as she wiped her nose. The olfactory explosion she'd just let loose managed to be loud enough to be heard more than a few meters away, surely loud enough to catch the attention of a nearby traveler. A groan of annoyance managed to escape her lips before she pulled her bandanna off her head and covered her chilling muzzle with it. "I hope they don't take too long getting here..." She said while tapping her free-hoof at the ground in rapid succession as she watched the horizon in from of the little dock by the ice sheet's edge. She was sure she'd sent those letters out with exact longitudinal and latitudinal coordinates for them to follow... She even left a handy map marked with her location on each envelope for each member she'd mailed. He REALLY had to think it over. It was already rather cold in Canterlot, but to leave the frosty royal city behind for an even colder area? It was an tough decision to make. Why did his adventures always up up in the north? Could he at least have one that took place in the Gallopocus Islands? During the summer? Wasn't there an rare Piña Colada recipe rumored to be hidden in the fabled 'Isla De Caballo Borracho' or was that from some book he read? Or maybe even an rare bikini only the sauciest of mares could dare wear? He knew the right pony for that job! And that was another thing! He would have to be away from his beloved Moony for more than a few days. This was something he had not done in what seemed like forever. Would he be able to handle this? He had brought along a small locket with her photo inside. And thankfully with the help of friend Nocturne Wisp, the white unicorn had managed to keep his 'heart' problem in control. This, thankfully did not involve the need for the magic anomaly researcher to use his rolled up newspaper on the love-struck stallion. But there were still times, when he just could not control the 'hearts'. When an magical creature, such as Pocket Change had a heart that was FULL of love, the spell-caster would summon, sometimes without even knowing it, a small horde of soft-light illusions that resembled cartoon hearts of several different colors. While harmless alone, these illusions could be a nuisance when summoned into hordes. And were extremely annoying when witnessed by single ponies, such as his old friend. Pocket would also need to turn on his more serious side. While he had seen the inventor at his little guild party, he was not able to chat with her as much as he would have liked. From what he had seen, while she was quite the looker, she always seemed to have an deep frown on her face that sort of ruined it for him. Almost reminded him of an certain rock-loving mare he had once traveled with. Guess they all couldn't be like Presteza. Of course, she could have had her reasons for being that way. Maybe she was just shy? Or she had a ton of things on her mind? He had heard she was quite the genius, much like his own brother, or even Miss Ember Spark.And they tended to have -unique- types of personalities. Sometimes a tad bit on the delicate side. So he needed to be careful. After deciding to join Miss Bevel Gear, the stallion received a special letter in the mail that contained a map with the exact longitudinal and latitudinal coordinates to where their journey would begin. This was simple enough! A train ride from Canterlot to the Crystal Empire, followed by a somewhat bumpy wagon ride to small dock where the map had ended. Being the sort of pony who believed in being prepared. He wore a lightly enchanted, but full bodied winter coat that covered his recently gifted 'Masterwork Adventuring Shirt' that his good friend Javasun had got him last Hearth's Warming Eve. Pocket also wore a heavy cloak, winter horse-shoes and a pair of goggles. A full saddlebag was also buried under his cloak.As he made his way towards the dock, he pulled his hood down so the mare would recognize him.Sweet Celestia! She had sneezes like hurricane breezes! Giddy was a gross understatement for the state Maenad Descent was in. The layers of black clothing and cloaks she wore made it slightly harder for her to move, but her excitement still showed in her movements. She’d been invited, properly, to a scientific expedition. Not only did this bode well for her reputation, but it meant that they were sure to find something big. Something amazing. Maenad was close to salivating at whatever grand, ancient mystery that the group could end up uncovering. It was also because of that excitement that she had tried her best to get to the rendezvous on time. Utilizing the fact that her expression couldn't be seen, she let her eyes roam over the two ponies at the dock. Both looked prepared and capable and so Maenad Descent's own confidence surged. She'd hit the big leagues--or at least she was being given a chance to be in those leagues. She wouldn't waste it. Pathfinder had done so many things in her adventuring career that it brought home to her what few things she hadn't done. She had gone into the deepest darkest caves, temples, and ruins and come out with so much cool stuff that if she started a cool stuff museum she could pay off at least one of her outrageous medical bills. She had ventured in the Whitescar and seen the deadly Ghost Longship's mysteries laid to rest, and then went to Saddle Arabia where she managed to escape the Traps of the Mad Pharaoh with nary a scratch on her head. Scratches and broken stuff everywhere else, but not on her head. She had stopped evil organization, met her favorite author despite court orders, and even got married! Yes, she had many awesome adventures. But she needed more underwater stuff. Sure some say a pegasi doesn't belong underwater but anypony who said that didn't know Pathfinder. She deserved to go everywhere! She had been in the southern oceans of Equestria once or twice, found old seapony ruins, fought off all sorts of stuff. But that was super duper easy. Ponies went there all the time and you could just swim to friendly shores. That wasn't super adventurous, it was underwater adventure for foals level stuff. So she needed something better on her plate, something bigger, something that made her sit up and go woooo woooo woooo. This would work. An expedition to the frozen north, the tippy top of the mainland all the way into the harsh seas. Honestly she didn't need to care too much about who was going because the promise of adventure was so golden that she couldn't have escaped it's fierce orbit if she tried. And she didn't, because oh Celestia did she want this! She got to cross another cool area off of her adventuring list which stretched sixteen pages deep and then maybe she'd find some new stuff to add to it. Visit one, add two- that's the ticket to great and glorious adventure fun that never ended. So she had arrived early. Quite early. Very early, like a week early, because she had no prior arrangements. Plus it allowed her to scout the area. This area wasn't as safe and secure as ponies would like to think. 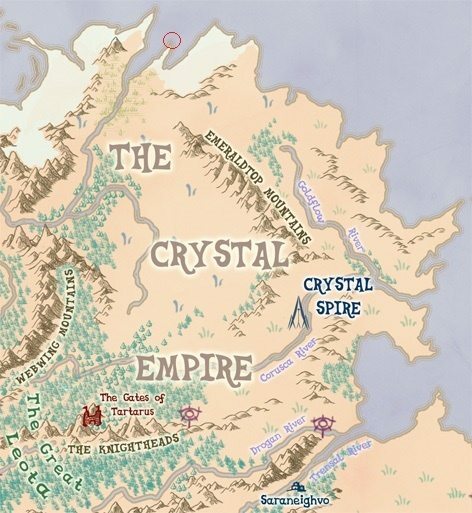 Basically anything north and east of the Emeraldtop's were Crystal Empire in Name Only as far as she was concerned. Caribou were always flying around and nomadically taking bits here and there, and they were on the very tippy top- who knows what manner of cool sea creature could be here? The answer had been not much. It was quiet, maybe only ten possible sea monsters. So after establishing the perimeter she had gathered up some clouds. And on this day, with her cloud floating in a somewhat lazy pattern in the sky above, she was napping. Pathfinder bolted up and in one swift motion poked her head through the cloud. Yep, she was there! The Greatest Living Adventurer (trademark, SnowFinder Industries) collected her gear and got herself prepped. Not long after the others started to arrive, Pathfinder shot down towards them and landed with an excited leap, getting into position not far from the group. "This should be loads of fun! No wandering caribou clans for two miles in every direction and I think I spotted a Kraken yesterday! Might have been a boat in a storm. Or a kraken! Probably just natural causes. Or a kraken!" "Oh dear... is really cold in here..." Blue Tide said to herself as she walked along the almost non existent path to where she was supposed to meet that odd mare. She was used to cold places as she spent most of her time in the ocean thanks to her job as captain in the Royal Equestrian Navy. Night out in the ocean were usually cold, and she had been sent to the northern regions of Equestria before, but it was always in her ship, and she could be comfortable below the main deck of the ship, in her quarters, or in the dinning room with the rest of her crew, but today, she was alone, and didn't had her ship as what she wanted to do didn't required it at all. She arrived to the area thanks to some friendly ponies that where going to the north for some reason, and left her close to the area she was supposed to meet the other mare that hired her. The past few days, she had prepared herself gathering a lot of stuff for the cold winters of the north, getting several jackets and winter clothing to keep her warm, but she had underestimated the area, and she still felt really cold. She had a light blue thick jacket on her that covered most of her body but legs as well as a hoodie to cover her head and ears, but even though all the clothing she had on, for some reason she still looked cute. It was something she couldn't control. No matter how hard she tried, or how though she was, she ended up looking cute almost all the time. "Eek!" Blue couldn't help it but let out a soft eek when she heard it, mostly by surprise, and hoped none heard it, as it would be rather embarrassing for her. She sighed and walked over to the group, seeing the rather interesting group she had in front of her. A pair of explorers she had heard of before, the mare that hired her for the expedition, and another mare she hadn't met before, most likely also member of the expedition. "You really make some really loud sneezes." She said calmly as she walked to the group, before standing up tall and saluting the group. "Captain Blue Tide of the Royal Equestrian Navy at your service." She said with a soft smile to the group, and still looking cute. 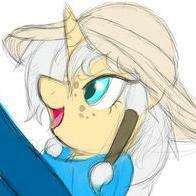 She then chuckled softly at what the adventurer mare said, smiling bit. "If it was a Kraken, this might jut started to get fun~" She said with a small and cute smirk. One of the first things Dunder's good friends knew about him was his sensitivity to the cold. Or his "cold-bloodedness" as he called it, since it sounded cooler that way. This wasn't just regular cold, this was advanced cold. Cold so cold it'd leak into your body from any body part exposed. After traveling to the frozen north enough times, he's learned what he has needed to successfully cloak his affliction. With a wool jacket so thick and a fear of his wings freezing solid and falling off, the pony hid his wings underneath his jacket, stripping him of flight. Just a few days ago, the pony was muzzle deep in crystal empire mead and hayburgers. Why couldn't the group have just met up back where there was food and a bearable climate? At least the pegasus was far enough to know that he couldn't turn back now. Anyway, how fun could this whole adventure be if it was going to be easy? Unles this was all a trap, and when he reached his destination there would just be a group of slaver caribou. Pretty elaborate trap, probably worth it since you'd have to be pretty tough to survive prancing off into nowhere. Just as Dunder was lost in thought, wondering how caribou sleep with antlers something shook the mountains. Definately a caribou warcry, or something. Best catch them off guard with a counter attack! Dunder started to gallop off in the direction of the cry. But as he crested over a small hill, he saw that the cry didn't come from a caribou, but a pony instead. Maybe it wasn't a trap, then. Slowly he made his way though the snow down to the group. When the pegasus met them, he pulled his blue scarf down under his chin to reveal his snout, reddened from the cold. As he trotted up on the gathered group he smiled from under his blue scarf. "Hey, you're not gonna enslave me, right?" He chuckled, laughing at his own paranoia. He was wearing a thick blue scarf around his neck, and a thick green wool coat that blew in the wind. Over his forelegs were padded black boots with reinforced fronts to cut through snow easier. The mare's eyes adjusted a bit as she finally focused on the figure, him now arriving in range of her natural ocular capabilities. The mare lifted her bandana back up , the fabric covering her ears before she spoke up, "Thank you. It's good I got to see you again, Mister Change. I was hoping you'd be able to recognize the significance my invention could mean to fields such as archeology. I'll look forward to our time together." Soon there was the arrival of another pony, Bevel was able to piece together what she was saying through those thick layers of clothing that she wore and soon the faintest tinge of pink crossed her cheeks as her brow furrowed slightly. "Um... thank you?" She responded in that manner of speech where you seem like you're not sure whether you're asking something or not, "It's good to have you *sniffle* Miss Maenad. I Hear your skill as a folklorist is well warranted." Bevel almost leapt out of her skin once the khaki pegasus made her entrance. Thank goodness this Ice sheet was thick, it was one reason she chose this spot to launch from. Once the mare came into closer view she tilted her head a bit, "Well I've heard the Daring Do comparisons made in your recommendations but they downplayed the resemblance greatly." Bevel wasn't a huge Daring Do fan to be honest, She was more of a Shadow spade kind of mare when she had the time to read for recreation. Still if this Pathfinder was as good an adventurer as she was rumored to be it would be foolish to leave her out of this. 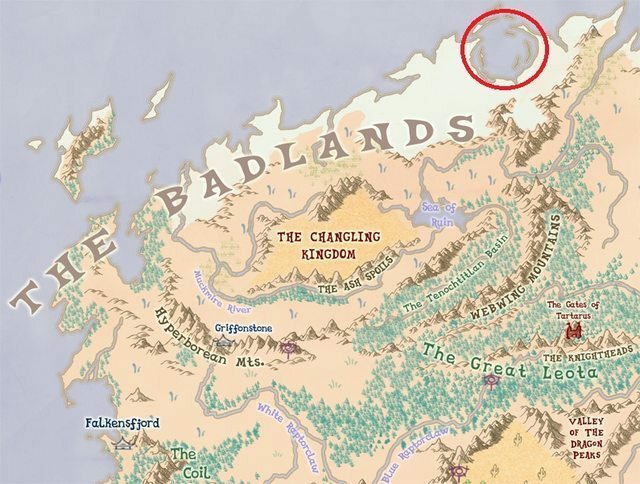 "There are in fact sea monsters in this area, not as many in the waters closest to whitescar but a few. I have deterrents in place on our method of transportation to prevent the more dangerous ones from coming too close and some devices to subdue the ones who are unwise enough to approach." The Blush on Bevel's cheeks only grew more noticeable as Blue tide spoke up about the sneeze moments ago, "I -I'm well aware. I will do my best to prevent any future sternutations from me in the future." The mare bowed her head to the mare, "I would like to thank you again for coming, Miss Blue Tide. I'm sure the navy will be interested in my vessel's performance. 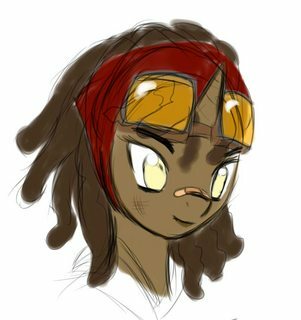 The arrival of a red nosed pony threw bevel off guard, if he was sick he shouldn't have come ... then again it could just be a sensitivity to cold. "Well... Thank you for agreeing to be the muscle on this voyage, Mister Dunder Blust." She opened up her suitcase and offered the stallion some tissues before gesturing him to come to the docks. Soon there was a Rumbling noise followed by churning bubbling from the waters behind her. Foam began to spread over the smooth pristine calm of the sea as something emerged from behind her. At first, one might have assumed it was a Kraken as spoken about before but as more and more of it was revealed, the sheets of freezing waters flowing down the curves of it's side revealed what was unmistakably metal. 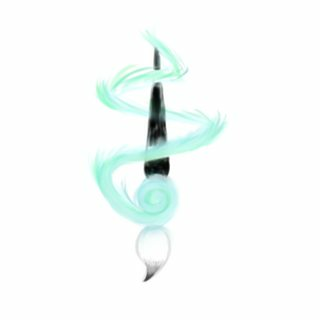 As more of it's shape was revealed it turned out to be similar to a Narwhal in shape with a sharp spike at the bow of it. The large vessel surfaced just enough to reveal the spherical viewing area at the top. Soon the entry point at the top let our a tone , signifying it was safe to enter. "I present, The Endeavor." The Unicorn gestured to the ship before climbing up the ladder and reaching the top and then opened up the hatch. "There's a rec room inside along with magically powered light and heat. It would probably be best we did the briefing after everyone is warmed up." Nearly moments after the young stallion had arrived, he watched as the others that would make up his little adventuring group found their way to the dock. While standing out in the horrible cold wasn't his cup of tea, he would have to deal with the harsh weather until their ship arrived. The first to arrive was rightfully covered up, but her wings gave him pause. She was one of those bat ponies, or as they're properly known, an Aerion. He had heard they made excellent spelunkers thanks to their ability to see in the dark. Her name also sounded rather familiar. Where he had heard it before? It took a moment to click, before he recalled hearing that name while doing a few orders while at the book store he had used to work in. While he had never read Maenad Descent's books before, he had seen a few of her titles while doing restocking one day. His boss, Price Clipp, would categorize the books with cute little icons that best fit each book. A cute little foal for children's books, two ponies in mid smooch for romance, and a pudgy little pig in a bath tub for.....pseudoscience. And while Price was not a fan of such books, they aways seemed to sell rather well at the Novel Hovel. The next one to pop over was another Pegasus mare. This one was a bit on the excitable side, which was good. Pocket also recognized the girl. He was not sure when or where he had seen her, but it was hard to forget the overeager Daring Do fan. But what was her name? Bookbinder? Sidewinder? Coffee Grinder? While a majority of his brain advised against it, the stallion spoke up. "If it's a big metal or wooden bit floating about with ponies on top, it's a boat. If it's got tentacles and googly eyes, then it's a Kraken." Hopefully they would not be facing such a beast. They have been known to destroy ships and gobble up ponies. The streak of Pegasus ponies ended as another pony cantered into view. It was another mare, which the unicorn wondered if he would be surrounded by ladies while on his little adventure. This would have been an idea thing around a year ago, but now that he was seeing somepony, things might get a little awkward. Still, he was a professional! He had worked with ponies, dragons, Diamond Dogs, griffons and a few other races from all over the world. Both gal and guy. He could handle this! And besides, she was in the military. Just like one of sister's little friends. Not only was she an officer in the R.E.A, she was a captain to boot! Pocket could see her helping to maintain order on her ship. Of course the question of the hour was....Where the heck was her ship? And while he wanted to ask his ship-y question, another pony showed up. This one was covered up, so Pocket was unsure what sort of pony he was. Or even who he was. Also there was a question about his joke, which the unicorn did not get. "Erm." His train of thought was quickly broken up by Bevel, who he turned his attention back to. "Invention?" She knew who the covered stallion was as well. Dunder. He had heard that name before. His sister knew the pony. Guess it was a small world after all. Pocket was curious about her invention. Was it in her suitcase? As if to answer his question, the inventor pulled out device, which she turned on. A smile fell upon her face, which made the usual serious mare look a tad bit on the 'adorkable' side. Shame she did not have a mirror on hoof to see how good she looked. She might smile more often if she had. He waited patiently for the grand reveal, and grand it was! "You know, a kracken is far from the only thing with tentacles and a taste for pulling ships under," though normally Maenad Descent would have been all set to start ranting, and perhaps dipping into a few tangents, her tone was absent. The reason was that all her attention was on their expedition leader. Maenad didn't care if it was inappropriate, watching the narwhal-styled submarine rise up from the waters in a dramatic show left her cackling. Loudly. Twenty Thousand Leagues Under The Sea was a riveting story, but seeing something as large and grand as Bevel's submarine was so much better than a mere description of another vessel, fictional or not. The Aerion had expected something modest and utilitarian, but this was, again, so much better. "No kracken or frenzy of luscas will be a worry in that!" She hollered. Maenad quickly couched and then flapped her wings twice before finally propelling herself into the frigid air. She wasn't unaffected by the cold and the idea of waiting for the others to board first never crossed her mind. Maenad had never been so close to something so magnificently constructed--and all for the purpose of discovery! The Endeavor was instantly one of her new favorite things. She flew through the air and pointedly ignored the shivering that her body started to do to put off the cold before letting herself drop hap-hazardously down the hatch, into the great submarine. from land monsters, and not just because they tended to be gooier and swimmier. Ponies could handle themselves fine on the land and even better, her at least, in the air. The sea was different! It was mysterious! Dangerous! Full of tentacles. It was lots of fun for the whole family and she was just sad she couldn't come here more often. At least now she was with others who watched the tentacled monsters of the deep to arrive. "Oh, I know there are krakens nearby. I saw a mating pair about two weeks ago when I was in the Undying Cyclone of the Master! Really interesting. I am going to name their kraken baby Krakey!" She said excitedly, waving to all the new fellows. As she got to meet and greet and greet and meet and all other nice ways of saying hi that had two ee's in it, the best part of the day happened. The most wonderful device she had seen in weeks- anything Snowy made was obviously best- emerged from the water, bubbles popping around it like an overgrown bath toy. It was some sort underwater shebang, whatever the word was! Cool! She liked underwater shebangs! Then the pressure of the seas wouldn't make them pop like meat balloons. Most importantly it meant that they were cool enough to be her adventuring buddies. "That looks pretty cool! Now we don't have to ingest the Bleak Pearls to not pop due to pressure!" She said, digging into her saddlebag and pulling out a small string of pearsl. Milky white, they seemed to fog and defog and swirl in her hooves. Back they went in. "Alright everypony! Let's hope into the underwater shebang travel thing and get this show on the road. Water road!" Blue just looked at the others when the one that brought them here opened the suitcase and pressed some buttons, and raised an eyebrow when the adventurer looking one talked a lot about Krakens mating and even name the baby kraken. Well, that was rather interesting... she supposed. She then saw the bubbles coming form the water and made a rather exited face, full of intrigue and wonder of what was going to come out, and the idea of actually a Kraken sound so much better now that before when she just arrived. Oh dear! What came out looked like some sort of ship that apparently could submerge into the water. That was even more amazing than a Kraken! "Wow...what is that?!" She said, clearly amazed by the invention the mare had just showed them. She had never seen one similar before, and smiled when the adventurer stallion talked. "A submarine boat... I like how it sounds." She said smiling as she gave a few steps forward to see it better. It was rather big, metallic, and as adventurer mare said, they wouldn't need anything to go underwater. No more spells, no more pills or suits. This machine was all they needed! She quickly trotted over to the ladder and climbed up behind the mare that hired them. "I can't wait to see it from the inside!" She said, looking adorably exited. Something was different about Bevel, peaking the stallion's interest as to what could catch his eye so. He quickly decided on the dreads, which fit her well. He reached a hoof out to her and took a tissue, he examined the small paper squares for a moment before looking up at her. "Thank you." He pressed the softness around his nose, blowing softly out his nose as to not disgust anypony. There was only one other stallion in the group, but he rung all the wrong bells. Dunder could have sworn that the pony was a mare last time Dunder saw him. It was probably a gender switcharoo like what happened to Prince Blueblood, but it might have just been a sister, a friend of Fire Walker. Other than this stallion and Bevel, the others were all strangers. Except the mare he could have sworn he saw on the cover of a book. Their discussion of a kracken frightened the pegasus stallion. Land monsters he could handle, the pegasus could just fly away. In the ocean, Dunder was in the monsters' dojo and there was nothing he could do about it. While lost in thought, Bevel was eager to get going. She summoned some devices and pressed a button. the previous discussion didn't help with Dunder's reaction. His wings flared straight up, and he gasped, lifting a leg to prepare to flee. But after being frozen in place in shock, he could see it was not a kracken, but the machine Bevel had construction. The reveal of the machine was reminiscent of another pony that Dunder knew. His mind was halted from wandering when the mare mentioned a heated room inside of the submarine, the pegasus followed close behind the group, eager to get inside before his wings froze solid. Miss Blue Tide seemed to share in the enthusiasm in air, Bevel currently had a serene if proud smile upon her lips before she responded. "I made sure that to incorporate some decent quarters for everyone to sleep in should the voyage take longer than expected. I also made sure to bring enough rations for that scenario." "I do now. I managed to build it with the assistance of my Silverbeak benefactors." She said to the stallion a hint of pride in her voice as she slide down the ladder to inside of the ship, "I've been working on blueprints for at least three years to make this and because of the improvements I've made after building upon previously existing designs I managed to make the endeavor tough enough to go deeper than any sub before it." Since Pocket was the only one with any questions and the last to board the sub, Bevel made sure to address him when he finally made it down the hatch. True to her word, the inside of the ship was indeed heated to a comfortable level. Bevel stood ahead of the group as they walked through the halls of the ship. out of the corner of everypony's eyes they might see a bit of movement as if some tiny crustaceans had stowed away on the ship... but there was a suspiciously large number of them if that was the case. Soon enough the scruffy inventor lead them to a spacious room with a wooden floor but metal on all sides and similar bent girders with markings on the edges that hummed with a faint power that spread across the ship, at the center of the room was a globe that had a marking on one particular part of the map. "Mister pocket, I'm sure I don't need to tell you what this place is and why it looks like this. For the sake of those in out group who do not know such history I will explain." And So the briefing (Or exposition) began.
" This area on the map has lasted for ages and is a constant feature of the geography and topography of the Badlands and according to some of the oldest records a large meteor hit this space... but I've some obscure texts that state that the place was actually the base of a civilization of ancient Seaponies that used a large shield to protect their kingdom from the impact, however the force of the meteor pushed the city down beneath the sea... Deeper than any organism could go until now." The Mare set her brief case down on against the table. She walked over to a desk in the corner of the room and levitated some charts over to the group. On the left end of the graph was a straight line that lead up to a date that showed sudden intense spikes in the frequency being measured. "While I was flying near the badlands The aetherometer on board my ship began picking up several intense vibrations from the depths of that area. There's something that's radiating magical energy down there, my theory is that whatever ancient magic or relic they used to save their kingdom is still down there. It shouldn't still have whatever shield magic it used before seeing as the spikes in magical readings are too far apart and unstable to be being used to conjure a shield." "We will be going deeper than many ponies have ever gone before... and if anything goes wrong after we hit a certain depth we will likely be waiting quite some time before rescue arrives. This is the only chance I can give you to back out. Any questions?" "Well, a Kraken won't have much to do with this vessel. ", the still very impressed stallion added, "He would take note that this boat was already under water and since his job technically was done for him, the great beast would then move on to other random acts of nautical nastiness." While he could not figure out why the mare had to put on such a show before getting into the submerged vehicle, after all, she could have simply walked over and climbed down the hatch. And speaking of a show, the next mare to make her way was......oooh! Now he remembered, it was Miss Pathfinder. He had heard of her name before he had seen her before, but where had he seen her before? She apparently had a bit of an reputation, but for some odd reason she dressed a bit like Daring Do. Maybe some ponies went a little silly after going on so many adventures. When he was a colt, the unicorn got to met jolly old Colonel Critchlow in Canterlot. He claimed to have cantered all over the globe at least twice, and while he was an interesting old horse, he was also very silly. While he wanted to point out that it was up to the parents to name their child, a few other questions formed in his mind. What do giant, terrifying krakens call themselves? He knew if he were to see one, it would probably be 'Arrrgh!' or 'Yikes!'. Also, what the heck is an 'shebang'? Sounds like something he attended while in college. Pocket Change waited patiently as the good Captain slowly made her way down the hatch. And while he stood calm, he did feel a little extra excited to enter the sub. Would this be like all the books he used to read as a kid? An voyage through lost underwater cities! Mermares! Sea Serpents! Although the last one did lose its luster when the unicorn noticed one rather large one gamboling about Ponyville one day. Still, these submarines were always built to be these crazy moving, underwater mansions, like one of Prince Blueblood's air-yachts. In reality, such a vehicle would probably limit its rooms as not to consume too much fuel. So there probably won't be an room just for the good captain to play on her old timey pipe organ. Once he entered the impressive submarine, he slowly followed the others as they made their way through the hallway. It felt so good, he assumed they would be able to drop off their jackets, scarves and other things that had kept them warm above. The mare lead the group into a room that contained a rather nifty globe. This looked somewhat like the one he had, but a good deal larger. And this one probably did not come free with an new account at the Bank of Canterlot. Pocket listened to Bevel's story. And yes, it was about seaponies and a lost city! Two very interesting things! Once she opened the floor to questions, the white unicorn had a few..."Wow, this sounds rather intriguing. ", the stallion was not bluffing. This did sound exciting! "I'm guessing whatever spell they used to protect themselves from the meteor probably keeps their city from being crushed by the great atmospheric pressure. And I'm unfortunately a -tad- bit ignorant of the good mere-folk. Are they capable of magic? If not, maybe they were able to seek help from outside of their city?" Maybe they were ponies before the great disturbance? And somehow through magic, they were turned into mere-folk? Would that be even possible? "So if were able to find this relic, what do you intend to do? ", he sure hoped she was going to say 'take photos' and study it. And then leave it the heck alone. Maenad tugged her shemagh off her head and face so that it rested in a bundle around her neck. There was something about being in an enclosed space and beneath the surface to Maenad Descent considerably. It was only then that she found that the sentiment held true within the sea just as much as it did in the earth. Submarines—Maenad had never been on one until now but she loved it. Even if there was a crab infestation. She was trying to keep a “clear mind” for as much of this as possible. It was kindly advice from her editor when dealing with the other, much more professional, truth-seekers and she did intend to keep it in mind. Still, she had theories all the same and so Maenad wanted to be able to check them even if on her own. Rings of eelgrass, the oceanic equivalent of a ring of mushrooms, could be a point in favor of any magic persisting after so long. Of course, not many had any credence to the rings, on land or sea. “That’s just the way they sometimes grow” was the common explanation, but magic was a tricky thing and Maenad Descent was of a stubborn nature. The inside was pretty cool. Crabs were fun! Sometimes they were under the control of larger, deadlier momma crabs who could telepathically order their little ones to battle for them. They made rather bothersome foes in the best meaning. But these ones appeared to be relatively harmless. Just cutesy! She liked those kinds too. Not as much as the antagonistic kind, but fun. She bent down and looked at the small crowd as Bevel started telling everypony about why they were here. She didn't need the scoop on the ancient civilization in the area, she knew all about them! They were cool, too. Almost as cool as the crab who tried to snap at her snout, which was rewarded with Pathfinder scooping it up and placing him on top of her hat. "I'm going to name this one Snappy!" she said to nopony in particular at the conclusion of Bevel's speech. As she allowed Snappy to snap up her pith helmet in great futility, Pathfinder continued. "Oh yeah, there was this great ancient seapony civilization here! It was unique because the waters in this area were shallow so you could see the cities as you flew above the water, and much of it was land, so they had a thriving equestrian pony population too. And then whiz-bang-kaboom! They get hit and pushed down. The ancient seaponies might have been able to survive a bit before the new pressure got to them, but the Equestrians? Nope! So when you're in the area, you'll find a cool mix of stuff," she booped Snappy off of her hat and the crab got down to her flank. She then proceeded to bounce him up and down as Snappy tried to snap her tail, missing each time. "You can find where a lot of the equestrians fled. South of here there is a series of caves which had been carved out for safety. Didn't help them much though- that range's gap happened because the big meteor that they had been preparing for hid a smaller one that followed and only separated in the last few hours. It smacked into most of those who fled, and only a few managed to survive, deep in the caves. They hide some valuables- like the All-Seeing Horn- there. Most of it was found by fortune seekers. You can find the Horn in lil' old Whitescar," she smiled, "Well, I can, at least. Speaking of canning, this thing sure looks fun. How fast does it go?" Blue couldn't help it but let out a small cute giggle at what Pathfinder was doing with the crabs, though there seemed to be something a bit... odd in them, in how they looked. She was going to say something until she heard what she said about this area. An ancient seapony civilization? She had heard rumors about that, but this was the location of it? That was amazing. She had just arrived to this place and she was already learning a lot of new stuff and having quite a fun time! She hoped the rest of the journey could be like this, even more by how the inside of the ship looked. It looked comfortable so far, and quite decorated. Blue was rather interested in what the mare that hired them was saying, but it was really hard to not to pay attention to the little cute snappy! She smiled and gently tried to poke it with her hoof, just to her a snap she barely managed to avoid from him. She giggled softly at that and gave a step back. "Looks like he doesn't like pokes." She said giggling before she turned to the others, hearing what Pathfinder was saying and the question Maenad had. She made a really good point. How would they be able to see what their eyes wouldn't be able to see thanks to the lack of light deep below the ocean? And finally, their mission Why they were there. It was to recover an artefact it seemed. And a magical artefact. This seemed like one of those adventure books she sometimes read, but in this case, it was going to be real, and where they had never been to. Below the ocean! "I also have a question?" She then said. "Do we have any idea of what this artefact might be? Or another clue other than the magical radiation it emits?" she said. Hopefully, there was another clue to what they were looking for, or they would have to follow the radiation and hope to find it. Going underwater to get warm did not register well with Dunder, but when the warmth hit he was comforted. After he cleared the hatch and made way for the 2 ponies left, he flexed his coat under his wings. The stallion reached back and grabbed his coat in his teeth to give his wings some room to breath. Just enough time for the group to set off to the recreation room Bevel had promised. As they made their way, the crustacean infestation was apparent. He recognized the little crabs, he actually learned how to prepare them since some ponies with exotic tastes liked to eat them. After seeing the brown mare naming one, he refrained from vocalizing the information. As they reached the hall, Dunder looked around and sized up the place. He thought there wouldn't even be a room like this. He could have sworn in a submmarine space would be conserved more. He wasn't the engineer though. Alas, he was zoning out again. POnies seemed to be asking questions now, and he reaised his own. "Where's the kitchen? I want to start cooking some hot chocolate." "That depends greatly on many factors. If we can find information or deduce what the properties of the Artefact and what surrounds it. If there is something alive down there that is keeping the artefact going and Vice versa I believe it should be studied and photographed for the use of the academic community." The inventor levitated her goggles off of her face and slipped on a pair of glasses, "If the artefact can be used to make the lives of creatures above ground easier than I wish to find a way to bring it back up and use it for the benefit of the surface dwellers... if there are no more creatures down there need it of course, but there are no solid plans on what will happen to the artefact until we get down there and study it beforetalon." The next pony who spoke up was Maenad, her question managed to get a faint smile of pride from Bevel. It was nice to here a question about her latest creation and current pride and joy. "These portholes here are actually made from the rare mineral Naiticite, very tough gem that can be strengthened by putting a magical current through it so that it can survive intense pressures better than glass... but Naiticite when takes on a peculiar property when light around it dims." The mare raised a hingleg and pushed a button behind her. A metal hatch began to close over the porthole and once it sealed the group could see the outline of every contour of metal and bolt covering the window before it went back down again. "As for finding samples of Zostera or Eelgrass... the depths at which we're going there's unlikely to be any down there as from my readings the city has been pushed down below where the sun's light can reach; the odds are slim but I'll allow the use of the viewing area for such a thing on our approach." There was a full moment of silence as the inventor watched pathfinder teasing one of the 'crabs' 'infesting' her ship. "I see you've met one of the clock golems I made to maintain the ship... oh right I remember this one." The mare squinted a bit, "Number 5NAPP1, he's a bit unfocused and too curious but he had character so I didn't rebuild him and he hasn't caused any problems on the ship... you can hold on to him if you like. If you find more please don't distract more than ... I suppose four more. They're vital to the inner workings of the Endeavor." Upon closer inspections by any of the group they would see that the crab on pathfinder's backside was bronze colored and had gears at it's joints and small bolts and screws over the shell and legs... it was a automaton! Bevel was relieved that Pathfinder was actually paying attention and any further worry was dissipated by another question about her ship, "When not assisted by magic and tides The Endeavor has clocked at about 10.5 knots... when the oceanic aetheric absorption drive is active it can go at fifteen knots depending on how many other features on the ship are disabled the vessel... so 10.5 at average top speed, emergency speed hasn't been fully tested as other functions are needed to maintain various devices on the ship." "Based on the old records of the event... it is an artefact that can keep a meteor from not only destroying the city, but slowing it's fall enough so that it didn't destroy everything else around it. All we have our theories and readings taken from a distance." "I'll Show you where momentarily, it's one floor down and it's been fully stocked. I will ask one last time if there are any who wish to leave." The inventor of the vessel lowered her glasses a bit in an almost theatrical manner, "Well?" The white stallion nodded his head as the inventor spoke. “Considering the amount of pressure this shield has had to hold back over the years, It’s bound to be very powerful, and even if there are still living creatures down there that rely on its protection, we could always just just take notes on it and copy the spell and whatever device that powers it.”, Pocket Change finally took notice of the strange crabs, causing him to shuffle away from their nasty pincers. “Spellbound has some rather powerful wizards in our happy little group, along with friendly connections to even more highly skilled unicorns, including two that that I know who are very skilled in Abjuration magics." Those two ponies were currently in dispose of at the moment, but he could probably send a message their way and ask for advice. A thought popped up in the young spell caster's mind, "Actually, now that I think about it, even if there are no living creatures down there, we'd still want to keep the shield on, that is if it's still working." Images of a lost city filled his mind, and he couldn't help but be a little extra excited over this trip. "I'd hate to be the one to send tons of water crashing onto a lost city filled with timeless artifacts and thus ruin probably one of the greatest finds of the century. That is, of course, if the shield is still up an running. ", he smiled and clamed up for a moment as to let the others ask the very clever inventor pony a question or two. He still could not believe his eyes. This was just like the submarine ride at Whinny Land, with the very big exception of this was real. No fake fish attached to fake coral here! And when they actually descended deeper into the dark abyss, it wasn't just bubbles being shot at their portholes. And while a sea chantey was just inches away from leaving his mouth, he quickly decided against breaking out in song. Pocket was quickly snapped back into reality when he heard the brown pony mention that he was going to -cook- some hot chocolate? How odd. "Ha! ", he grinned ear to ear after Bevel asked if anypony wished to leave. "I wouldn't go even if Princess Celestia was waiting for me outside to hoof out nobility titles and a huge sack of bits." He also hoped nopony else had started to suffer from cold hooves. This was the perfect size for a team. They had adventures, archaeologists, military and a pony who could cook hot chocolate. Who else would you need? Blue nodded at what the inventor said about the artifact. So they had no idea what it looked like or what they were looking for, other than the fact that it helped to maintain the city and it seemed that it was a meteor or rock that is slowly falling down.... well, this could be interesting. "Thank you!" Blue said smiling after a moment before she turned to the little crab Pathfinder had and heard the serial number. "5NAPP1" she repeated the name and tried to picture it as text. "Oh, snapp1! ... Snappy!" She said happily, almost like a filly as she realized the serial number was a pun for snap. She just looked as an adorable silly filly. She giggled a bit when she realized the adventurer mare had managed to name the crab similar to it's serial number. She soon let out a small squeak of joy when she heard they could distract at lest four more... apart from snappy.... so each one of them could have one! "Do you have a list of the number of them?" Blue soon asked regarding the cute crabs. She wanted to see if she could find another one with a serial number that looked as a word. Soon afterwards, she blinked as she realized what she was doing. She was acting like a filly! She blushed a bit and shrugged in embarrassment. "Sorry... got carried out..." She said softly and a bit embarrassed, just making her even more adorable. Dunder listened as Bevel talked of the automated crabs that helped run the vessel. After mentioning that they are crucial to the inner workings of the ship, Dunder became more wary of taking them. They were cute and all, but if he learned anything from expeditions on engineering feats, the more of the cogs are kept turning the better. He wasn't one for pets, anyway. When Bevel mentioned the lack of testing of the emergency speeds, he grew a little concerned. "Do you think the vessel will be able to handle going 15 knots? I mean, just looking at this place I'd guess it not even going over 1 knot. I mean, it's massive." Memories of Java's ship in overdrive, fleeing attackers, while metal plates flew off the side were not fond ones. The ship's structural compromization, Dunder figured, was due to getting attacked. There were no sky pirates deep in the ocean. Just much worse. Dunder shivered. Dunder chose not to speak up when offered the chance to leave. High time to leave, after just arriving. Cool, crab golems. Pathfinder had seen lots of golems in her time adventuring. Most of them were magically powered and tied to a specific sort or rite or spell and purpose, though universally they were considered parts of the law of creation, not of destruction. They were powerful menial laborers who could toil ceaselessly without sustenance. They could be given just about any physical task, but they were powerful beasts or warriors. Of course once they engaged in destruction they had a certain timer based on the power of the magic that created it. Most of them started to dissipate into the mud or rock that formed them within a minute or two- the more powerful ones could take about ten minutes. Techno golems probably didn't have the ability or other scary features, but could probably last longer once thy started destroying. But these ones weren't destroyer types, they were cute little crabs that helped with the ship. Waaaaaay more boring than destroyer ones, but cute was cute. Pathfinder fell on her back and started tossing the crab from one hoof to teh other, getting all four involved as Snappy tried to snap her hocks or hooves or whatever else was in range. It was a game of hot potato, except maybe more like snap potato. As she played she listened to what was being discussed. In her experience, shields o barriers didn't last this long, especially after a disaster like the one they had endured in that sea-city. At least not entirely intact. There was almost trouble to be had and nothing lasted forever, not even magic. "Well, I wouldn't count on the shield being intact. All the way at least. In my experience barriers that take big hits like that tend to shatter. If this city is like other seapony ruins, there will be secondary and backup barriers that protect certain parts of the city. Parts will be flooded, others won't. Should be fun either way, isn't that right Snappy?" She said, no-selling the question of whether or not to leave the ship because it was downright silly. "Based off the info on the scrolls that mention this city have elaborated on... there were multiple flashes of magic dotting the city before the large one that erected the primary barrier finally went off. Regardless, the primary shield may still be functioning to some extent but not a particularly potent effect. It is also possibel the shields dottign the city may be weaker than they were at the beginning as well. This is all guess work however. We cannot know until we reach it..." The inventor turned away from the group a moment and faces what appeared to be a console with many runes and symbols over it's entirety. If the group quieted they were hear the many sounds that the devices and magical circuits that made the vessel operate at work. There were fanciful clicks, clacks, whirring and what sounded almost like a horn wheezing as various lights began to spread over the interior of the Submarine. "Of course." She said in a slightly chipper tone, "Once We're underway and the autopilot, aetheric sensor, the safety barrier are up I'd be happy to show you the heart." There was a momentary pause after the greyish brown stallion asked his question. While certain ponies couldn't see it due to her position, those who looked at her reflection in the observation deck's window. The mare bore a furrowed brow and look of annoyance at this before she turned back with a more neutral expression. "Do I -think- it will? No. I don't think, I -KNOW- she will. I went over the calculations and all the factors hundreds of time over in my mind and on paper." The mare stepped down from the panel before her and counted those who had spoke; none voiced hesitation. "However if you truly doubt The Endeavor's capabilities... Allow me to show you how fast she goes at regular speed." The mare telekinetically pressed a button behind her.. and then another. First came a loud humming sound that seemed to originate from somewhere near the back of the ship... and then came music. Sweeping orchestral music that give the impression of something momentous happening as the ship began to move forward. The seas ahead of them were clear and iceberg free from all angles and thanks to the ship's special sensor an alarm would sound off when there was a chance of collision. at first the ship moved slowly but as it warmed up the vehicle quickly reached it's 10.5 knot speed as promised. Waves splashed by the ship's observation window before it was covered by the sea. An endless shade of blue seemed to stretch before our travelers. Rays of light dancing in the depths as the waves refracted and bent them... there were just some sights you'd have the hardest time getting on land. There was no sound of hull's rupturing or straining metal so if anything that should calm the stallion's nerves. For the music, think something like... this! The white coated stallion could not help but be amused by Captain Blue Tide and her antics. When she apologized, Pocket Change shook his head, "Nah, there's no need to say you're sorry." She broke his mental image of a sea going captain. She was not some large figure carved by the very sea salts and rough winds into a tough talking, hard drinking military mare. She was just so darn cute. Maybe she did not act this way all the time. The act of being in such an wonderful marvel probably just set her off. "This is so just utterly amazing. ",his eyes were never bored while they continued to trek through Bevel's impressive submarine. He had a feeling that he would be impressed even by the bathroom..Or did they call it a 'head'? "There's no need to hide your enthusiasm. ", he added, "This is just amazing. As if they smooshed Cleverboot's 'Polar Star' and whatever Blueblood named his airship together and added an extra dose of awesome." He nodded as the Daring Do duplicate had her say, "I wouldn't be surprised if the shield had been shut down ages ago, but I also would not be surprised if it's still running. ", the stallion added, "If you've ever read about ancient magic, they did some rather crazy stuff back then. Old hedge wizards and covens would just create these group spells that would just go on forever. Remember, before Princess Celestia and Princess Luna came about, it was these guys who raised the sun and moon. And I've heard plenty of stories about old magic popping up in the form of old teleportation devices, active guardian golems. These guys did their magic and could care less what other ponies thought about it. " One thing that Bevel mentioned peeked the unicorn's curiosity. This ship was running on an autopilot? No captain was at the helm? While this was rather simple for an airship as there tended to be very little for such an ship to crash into, unless near civilization. But under the sea? There was bound to be all kinds of things that vessel could crash into. Large fish! Ice blocks! Shipwrecks! And now they were moving even quicker. "Miss Bevel. ", Pocket Change was always the polite and proper Canterlot pony, "What is this 'aetheric sensor' that you speak of? And how does an submarine's autopilot work? I can almost picture the things we could run into while down here."